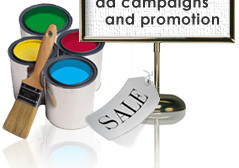 Successful advertising and sales promotion programs require a delicate blending of strategic planning, strong messages and dynamic visual design. Without a good plan, goals are not achieved and funds are wasted. Without a newsworthy message, advertisements are beautiful wastes of money. Without captivating graphics, they are ignored. Copyright © 1998 – 2009 LNS Design and Marketing. All Rights Reserved.